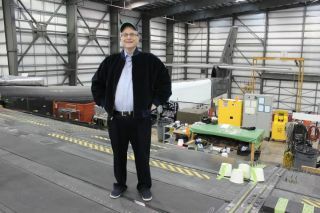 Stratolaunch Systems founder Paul G. Allen, billionaire tech entrepreneur and philanthropist, stands on the main wing of the massive Stratolaunch carrier aircraft designed to launch rockets into space. Allen died Oct. 15, 2018. He was 65. The technology titan, philanthropist and private-spaceflight entrepreneur Paul G. Allen died Monday (Oct. 15) at the age of 65. Allen — who co-founded Microsoft and Stratolaunch Systems, among many other ventures, and donated several billion dollars to various causes over the years — passed away in Seattle from complications of non-Hodgkin's lymphoma. Allen was a man of many interests, which ranged from technology to the arts to sports to spaceflight and the search for alien life. For example, Allen provided the seed money for the Allen Telescope Array (ATA), a network of 42 radio dishes in Northern California that's used by the SETI (Search for Extraterrestrial Intelligence) Institute to listen for possible pings from E.T. Allen ended up donating more than $30 million to the ATA project, SETI Institute representatives have said. Allen funded pioneering aerospace engineer Burt Rutan's SpaceShipOne project, which in 2004 became the first private, crewed vehicle to reach space. The basic design behind SpaceShipOne is now being developed by Virgin Galactic as the SpaceShipTwo suborbital spaceliner. In December 2011, Allen and Rutan announced the existence of Stratolaunch Systems, which is working to launch satellites in midair from a giant airplane — the largest airplane ever built, in fact, which boasts a wingspan of 385 feet (117 meters). While Allen donated generously to arts-oriented and educational organizations over the years, much of his philanthropy centered on advancing scientific research, environmental conservation and public health. For instance, he has established institutes to perform cutting-edge research on artificial intelligence, neuroscience and cell biology, and his money has funded many efforts to combat illegal fishing, overfishing and the poaching and trafficking of endangered species. Allen, who lived in Seattle, also owned the NFL's Seattle Seahawks and the Portland Trail Blazers of the NBA. "All of us who had the honor of working with Paul feel inexpressible loss today. He possessed a remarkable intellect and a passion to solve some of the world’s most difficult problems, with the conviction that creative thinking and new approaches could make profound and lasting impact," Vulcan Inc. CEO Bill Hilf said in the same statement. "Millions of people were touched by his generosity, his persistence in pursuit of a better world, and his drive to accomplish as much as he could with the time and resources at his disposal," Hilf added. Allen was diagnosed with Hodgkin's lymphoma in 1982 and non-Hodgkin's lymphoma in 2009.